Definition Materials where electrons remain on the surface of it and do not move about freely within the material. Materials that allow electrons to move freely within the material. What happen when adding or removing electrons? When electrons are gained or lost in an insulator, the electron remains at the region where it was transferred. i.e it is “localized”. When electrons are gained or lost in a conductor, the electrons will be redistributed. 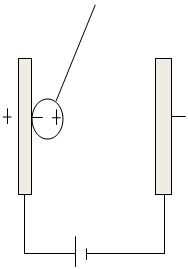 A neutral light conducting ball, suspended between two light conducting charged plates, touches the positively charged plate as shown. Describe the subsequent motion of the conducting ball between the conducting plates? When the conducting neutral ball touches the positive plate, the electrons in the neutral ball will be attracted to the side near the positive plate and move into the plate. This causes the ball to have excess positive charges and becomes positively charged. Since like charges repel, it will repel towards negative plate and touch it. Again, upon touching, the electrons in the ball will be repelled away and electrons from negative plate will move into the ball to neutralize the positive charges in the ball. This cause the ball to have excess electron and becomes negatively charged. Since like charges repel, it will repel towards positive plate and whole process repeats. The conducting ball will oscillate to and fro between plates until the battery is depleted. ﻿When the insulating neutral ball touches the positive plate, the electrons in the neutral ball will be attracted to the side near the positive plate.